Csaba Tamas has created 20 levels of this interesting maze puzzle set. 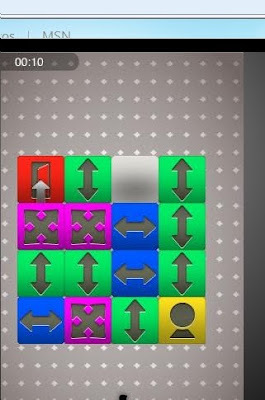 Each level consists of 3 or 4 puzzles. Object: move your man from the bottom, to the door. As you move, your square will swap places with the new square. Fast, fun series of puzzles. Maybe too easy. This Mechanical Puzzle Correspondent did the entire set in 36 minutes. 99 cents is a fair price. Because the Lab Mice Puzzle books have sold so well, Mindware has adopted the genre and created 100 new puzzles ranging from easy to hard. The puzzles are printed on laminated cards. The set contains dry erase markers. Since the holidays are just around the corner.....why not buy multiple sets for everybody you know!